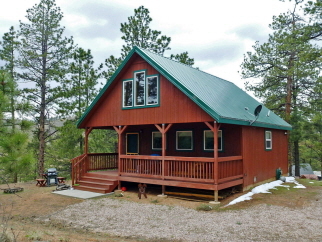 Escape to this like-new mountain cabin that works great for a full-time or vacation home on two lots! Vaulted tongue & groove ceilings throughout the cabin. Beautiful hardwood floors on the first level add warmth to the decor. There is a spacious master loft. Additional loft space could be finished for a great play area, library or art loft. Energy efficient vinyl windows and metal roof. Relax on the covered front porch or hike into adjoining National Forest. Quick trip to Deckers, Pine, Denver, Woodland Park or Colorado Springs. Close to world class fly fishing on the Platte River. Annual fishing permit for private stocked lake is available. The current owner counts birds for Cornell University Ornithology-- Mountain Blue Jays, Humming Birds, and Blue Herons galore—bring your camera! Interior Features Home is on community water and is $380 for entire year. Exterior Features Adjoins National Forest!